The Monnaie de Paris have launched (20th January) a new set of coins highlighting the many treasures of the French capital, Paris. This second set of coins follows last year’s set, which featured the Palais Garnier and Institut de France. 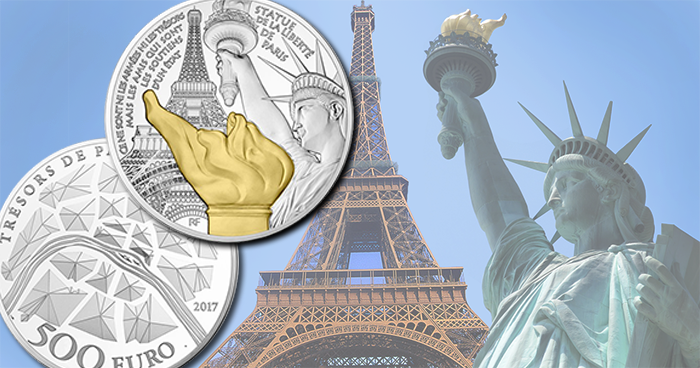 The first coin in the 2017-dated series pays special homage to one of the world’s most enduring symbols of both the friendship which exists between two nations and the sentiment behind its creation—Liberty. 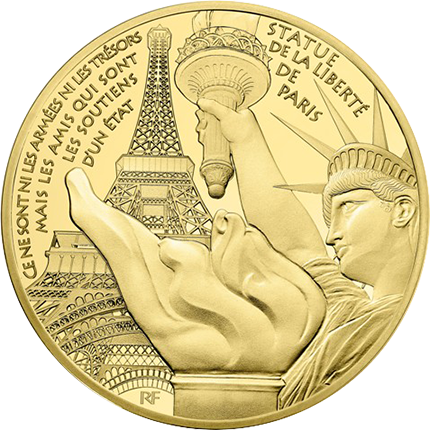 The obverse of the coin includes a view of the Statue of Liberty of Grenelle; in the background is the Eiffel Tower, since both monuments were constructed by Gustaf Eiffel. On the foreground, the flame of the Statue of Liberty is visible with selectively plated gold on the silver coins highlighting the flame. Around the coin is the text CE NE SONT NI LES ARMÉES NI LES TRÉSORS MAIS LES AMIS QUI SONT LES SOUTIENS D’UN ÉTAT (Neither armies nor treasure forms the walls of the kingdom if they are true friends). This text is placed to the left of the Eiffel Tower, with STATUE DE LA LIBERTÉ DE PARIS to the right. The reverse design is a standard motif used for last year’s series, and is a modern representation of Paris and its 20 districts. 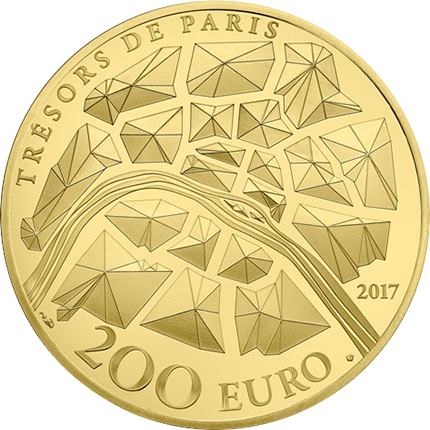 At the top is written the name of the collection, TRÉSORS DE PARIS, with the year of issue and the face value at the bottom of the coin. The launch date for the first set of the 2017-dated coins in the Treasures of Paris series is today, 14th February. Each piece is presented in a custom case and accompanied with certificate of authenticity. A second set this year will be announced in due course. For more information on these and other coins offered by the Monnaie de Paris, please visit their website. The Statue of Liberty, as many know, is located in New York Harbor just off the coast of the Island of Manhattan. It is situated on a small natural plot of land renamed Liberty Island in 1956. What may not be known to those admirers of the Statue of Liberty is that it was given to the people of the United States by the government of France, on the occasion of the centennial anniversary of the proclamation of American Independence in 1876. France was the first country to recognise American independence and also sent troops to fight the British during the American Revolution, which eventually secured that declared independence. However, due to the instability of the French government and a changeover from the Second Empire to France’s Third Republic during the 1870’s, construction of this colossal statue did not commence until after stability was restored. Coin Update sponsor APMEX carries the Treasures of Paris series and other beautiful coins from the Monnaie de Paris. The idea for the collaboration between France and the United States for this monument to friendship was proposed as early as 1865 by Édouard René de Laboulaye (1811–1883), a popular politician who had in mind a grandiose way to congratulate Washington for their victory during the American Civil War. The project was assigned to Frédéric Auguste Bartholdi (1834–1904), an eminent French sculptor whose works in his hometown of Colmar caught the attention of Laboulaye. The actual construction would be awarded to Gustaf Eiffel (1832–1923), who had already made a name for himself by designing bridges for France’s extensive railway network. By 1875, Laboulaye proposed and agreed with the American government that the French would finance the statue and the Americans would finance and provide the site, which included building the pedestal. Construction of the statue was already underway by the time the agreement was in place and by 1876, the actual centennial year, the torch-bearing arm of the monument was on display during the Centennial Exposition held in Philadelphia. Consequently, the now-familiar head of Miss Liberty was also put on display during the Paris World’s Fair in 1878. The arm would later be displayed in Madison Square Park until 1882 in an effort to encourage private funding for the pedestal—which, due to economic uncertainties, proved very difficult. Eventually, with greater promotion by the New York World newspaper, the contributions began to come in, and more than $120,000 was raised to complete the project. The remainder of the statue, which had been shipped over in a number of crates, was assembled in New York and placed on the pedestal. The dedication date was the 28th October 1886, at which time the first-ever ticker-tape parade was organised in the presence of President Grover Cleveland.